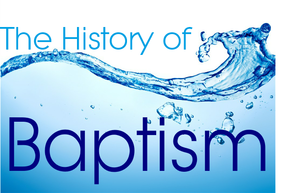 Did you know that baptism can be traced all the way back to the Old Testament? In the Book of Genesis eight individuals were saved from the flood. Peter pointed to this in 1 Peter 3:21 when he said that “Baptism, which corresponds to this [the flood], now saves you through the resurrection of Jesus Christ.” The great flood in Genesis 7 destroyed everything and was a display of God’s judgment on mankind. Water and submersion by water brought death in the Old Testament, but Noah and his family found favor in the sign of the Lord. As a result, God spared he and his wife, as well as each of his sons and their wives from the flood. God again chose to spare His people in the parting of the Red Sea, which is referenced in 1 Corinthians 10:2. Prior to the new covenant, water was an agent of death, yet God used Moses to save the Israelites from the immersive water in Exodus 14:21-22. The Egyptians did not survive because they did not fear and serve the Lord. It is also interesting to take note of the Scripture in parenthesis in 1 Peter 3:21. Baptism is not the removal of filth of the flesh, but rather “the pledge of a good conscience toward God.” It is crucial for us to understand that baptism is a symbolic act of obedience in following Christ. Old Testament prophets used water as an outward symbol for internal cleansing (Isa. 1:16; Ezek. 36:25; Ps. 51:2). 1 The new covenant and Christ’s arrival changed this when he made baptism a symbol of the rescue His resurrection provides believers from death (1 Pet. 3:21). John the Baptist prepared the way for Christ and helped to usher in the new covenant. He was the final prophet of the old covenant. Matthew 3:11-16 recounts John the Baptist baptizing Jesus in the Jordan River. Jesus made the ultimate sacrifice and also set an example for believers to follow Him in baptism. We must not forget the substance of baptism—Jesus’ blood which removes our sinfulness. While water cleanses our outside, the blood of Jesus cleanses our hearts from sin.